Blasting is required to breakup and fracture the bedrock so proposed excavations can occur to the desired elevations. 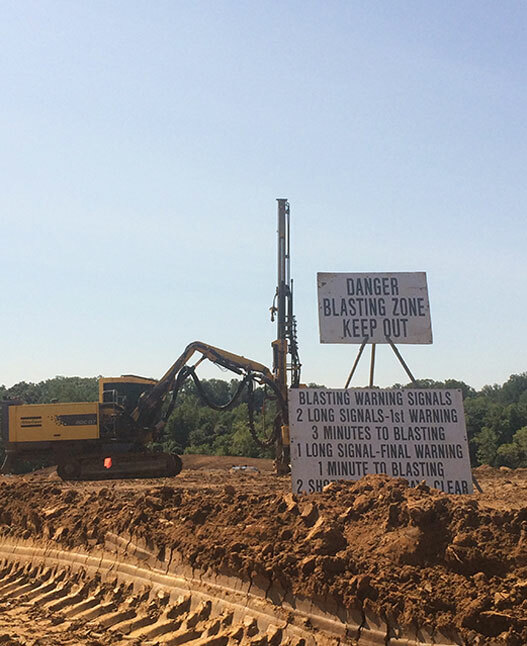 Blasting is often the only economical option to break the rock for excavation. Seismographs are placed at the site to monitor vibration levels. The seismograph is typically placed at the closest home or structure. Additionally, blasting operations must be carried out in such a manner that they will not cause fly rock or damage from the air blast overpressure or ground vibrations. How long does the blast last? Typical blasts are less than 10 seconds long. My neighbor received a blasting notice or an offer for a preblast inspection, but I didn’t. Why? Written notifications and offers for preblast inspections are sent out to specific property owners located within a certain radius of the proposed blasting areas. If you have not received a notice, you are most likely located outside of the predetermined radius. The actual distance varies and is typically determine by governmental regulatory authorities. Will I hear the warning signal before each blast? Your ability to hear the blasting warring signals before each blast will depend on a lot of factors. The warning signals are very loud and can be heard at long distances. However, the intent of those signals is to warn those closest to the blast area. The distance at which you can hear the signal will depend on other construction noise, man made and natural barriers, the direction of the wind, if your windows are open/ closed, etc. Who do I contact first if I have any questions or concerns about the blasting?